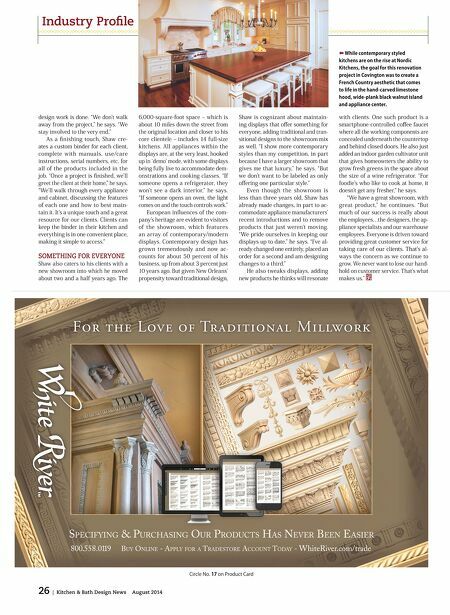 26 | Kitchen & Bath Design News August 2014 Industry Profle For the Love of Traditional Millwork SPECIFYING & PURCHASING OUR PRODUCTS HAS NEVER BEEN EASIER 800.558.0119 BUY ONLINE - APPLY FOR A TRADESTORE ACCOUNT TODAY - WhiteRiver.com/trade Circle No. 17 on Product Card design work is done. "We don't walk away from the project," he says. "We stay involved to the very end." As a fnishing touch, Shaw cre- ates a custom binder for each client, complete with manuals, use/care instructions, serial numbers, etc. for all of the products included in the job. "Once a project is fnished, we'll greet the client at their home," he says. "We'll walk through every appliance and cabinet, discussing the features of each one and how to best main- tain it. It's a unique touch and a great resource for our clients. 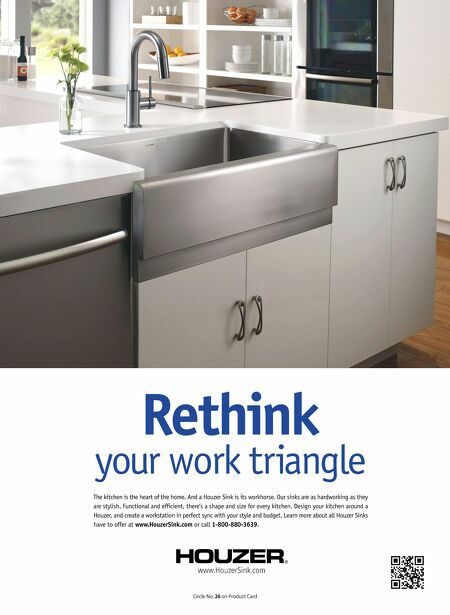 Clients can keep the binder in their kitchen and everything is in one convenient place, making it simple to access." SOMETHING FOR EVERYONE Shaw also caters to his clients with a new showroom into which he moved about two and a half years ago. The 6,000-square-foot space – which is about 10 miles down the street from the original location and closer to his core clientele – includes 14 full-size kitchens. All appliances within the displays are, at the very least, hooked up in 'demo' mode, with some displays being fully live to accommodate dem- onstrations and cooking classes. "If someone opens a refrigerator, they won't see a dark interior," he says. "If someone opens an oven, the light comes on and the touch controls work." European infuences of the com- pany's heritage are evident to visitors of the showroom, which features an array of contemporary/modern displays. Contemporary design has grown tremendously and now ac- counts for about 50 percent of his business, up from about 3 percent just 10 years ago. But given New Orleans' propensity toward traditional design, Shaw is cognizant about maintain- ing displays that ofer something for everyone, adding traditional and tran- sitional designs to the showroom mix as well. "I show more contemporary styles than my competition, in part because I have a larger showroom that gives me that luxury," he says. "But we don't want to be labeled as only ofering one particular style." Even though the showroom is less than three years old, Shaw has already made changes, in part to ac- commodate appliance manufacturers' recent introductions and to remove products that just weren't moving. "We pride ourselves in keeping our displays up to date," he says. "I've al- ready changed one entirely, placed an order for a second and am designing changes to a third." He also tweaks displays, adding new products he thinks will resonate with clients. One such product is a smartphone-controlled cofee faucet where all the working components are concealed underneath the countertop and behind closed doors. He also just added an indoor garden cultivator unit that gives homeowners the ability to grow fresh greens in the space about the size of a wine refrigerator. "For foodie's who like to cook at home, it doesn't get any fresher," he says. "We have a great showroom, with great product," he continues. "But much of our success is really about the employees…the designers, the ap- pliance specialists and our warehouse employees. Everyone is driven toward providing great customer service for taking care of our clients. That's al- ways the concern as we continue to grow. We never want to lose our hand- hold on customer service. That's what makes us." ⬅ While contemporary styled kitchens are on the rise at Nordic Kitchens, the goal for this renovation project in Covington was to create a French Country aesthetic that comes to life in the hand-carved limestone hood, wide-plank black walnut island and appliance center.